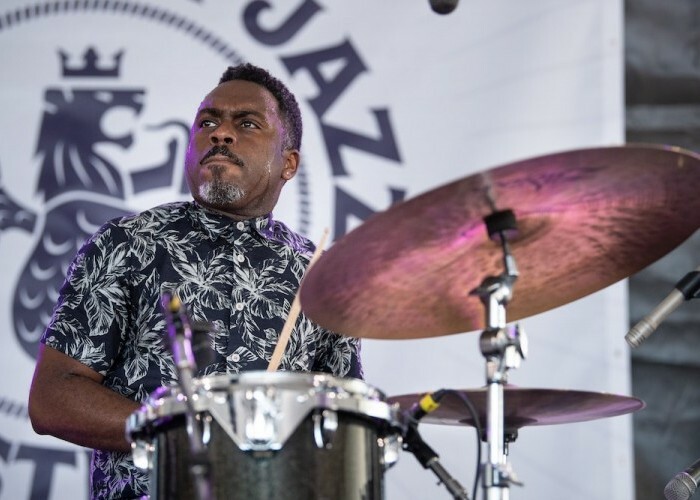 Nate Smith’s solo drum suite, Pocket Change, marks the 44-year-old drummer’s second response to a question he asked himself several years ago, when bassist Dave Holland and saxophonist Chris Potter—with whom he made odd meters flow for much of the latter aughts—began to focus on new projects with different personnel. The result was 2017’s Kinfolk: Postcards From Everywhere (Ropeadope), a do-it-yourself production on which Smith augmented a strong unit with the voice of Gretchen Parlato, as well as some previous employers, including guitarists Lionel Loueke and Adam Rogers. Distinct melodies complement an array of Smith’s bespoke grooves, executed with drum-machine precision and a speculative attitude. As a producer, Smith was careful not to let the bells and whistles obscure the idiosyncratic personalities of his associates. While conceiving Kinfolk, Smith was creating beats for various clients, including a collaboration with The Loop Loft (a sample shop that was acquired by Native Instruments in 2018). The Loop Loft will release select drum patterns as Nate Smith Vol. 3, Pocket Change, while Smith will self-release the proper album on vinyl and digital formats. He noticed a substantial uptick in Instagram-YouTube-Facebook engagement in response to promotional videos on which he plays “simple-sounding grooves that I try to switch up and change.” He mashed up jazz titans like Elvin Jones, Max Roach and Art Blakey, as well as contemporary influences like Omar Hakim, Bernard “Pretty” Purdie and Steve Gadd, and hip-hop avatars like J Dilla and Questlove.